10 Cloverfield Lane is a somewhat awkward mating of two genres: the women in danger film (aka, a female thriller) and an alien invasion film. What’s so surprising is that despite the clunkiness of said mating, the movie is very enjoyable and more or less works on its own terms. The basic premise here revolves around a young woman who leaves her boyfriend for reasons unknown and on her way to wherever it is she is going, if she’s actually going somewhere, her car is broadsided and goes over the side of the road. She loses consciousness only to wake up in an underground bunker replete with a conspiracy theorist who claims that America has been attacked and they may be the only survivors. Is he crazy? Is he telling the truth? Or is he both? One can’t help but admire how well the movie is made and how well it works in spite of the unwieldy structure. Certainly, one has to give props to the writers (Josh Campbell, Matthew Stuecken and Damien Chazelle—the last of Whiplash fame). Just when act two starts and you have no idea how they can possibly keep the story going anywhere interesting, they pull some nice rabbits out of their hats and the mystery deepens rather than stalls. And just when you think they’ve painted their way into a corner, you realize, well, okay, yes they have, but somehow it all holds together as a satisfying enough hour or so of brain candy entertainment. Other props must go to the trio of actors here. They all take the whole thing so incredibly serious and treat it as if the movie is destined to be a classic. 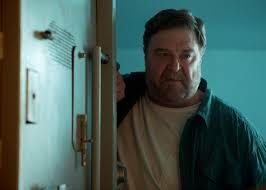 This is certainly one of the best roles John Goodman has had for some time. He’s the “is he or isn’t he” or perhaps more accurate, the “is he and is he” builder of said bunker. He turns his emotions on a dime and makes us not so much believe the character, but makes us not really care if he is believable or not. Goodman is just having too much fun. Mary Elizabeth Winstead is the Katniss Everdeen heroine, Michelle, a fashion designer by day, a worthy opponent to a maniac by night. I mean, who knew the skills of a needle and thread expert could be far superior at taking out murderous aliens than an army of Navy Seals? The last few scenes may be a little hard to buy once she escapes the bunker, but at that point, special effects take over and we overlook just how overly capable her character is. Last but not least, Josh Gallagher, Jr. plays Emmett, a sweet good nature good ole boy who would fit right in with a remake of The Dukes of Hazard who had to fight his way into the bunker. Gallagher gives the role a nice understated gravitas. 10 Cloverfield Lane is a sort of, but not really, sequel to the hit found footage movie Cloverfield. However, though it may have a connection to that earlier film, it’s totally its own story and can be enjoyed without having seen the first. Directed by Dan Trachtenberg (his feature film directorial debut) who does as much for claustrophobic action as Lenny Abrahamson did in Room. Bradley Cooper provides the voice for Michelle’s boyfriend at the beginning. I remember growing up during the hey-day of the disaster flick, starting with Airport and continuing on through The Poseidon Adventure, Earthquake and The Towering Inferno. As much as I got a kick out of them, even at the time I knew they were pretty cheesy. And not much has changed since then except that the destruction may often take a more apocalyptic feel (2012, The Day After Tomorrow and the never ending series of superhero films that seems to have turned New York City into the new Tokyo). 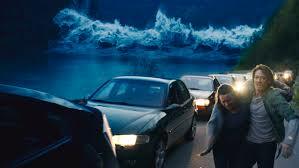 From that perspective, The Wave, written by John Kare Raeke and Harold Rosenlow-Eeg and directed by Roar Uthaug, may be a bit more of a throwback to the earlier entries in this genre. It’s more localized, smaller, and more focused on the characters than the disaster itself. And it’s all the better for it. 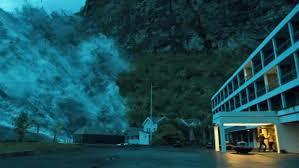 The story takes place in Norway at a tourist town on a large lake surrounded by mountains of great size. Since there is always the chance that an avalanche could send much of the mountain into the lake and cause a tsunami big enough to dwarf the town, the government has set up a watchdog group of geologists to see if they can foresee a deadly avalanche and warn the town before it’s too late. Well, of course you know what happens. But that doesn’t get in the way of how enjoyable the movie becomes. It’s an edge of your seat bit of entertainment with terrifying scenes of mass destruction, and I mean terrifying (the tsunami is a pretty neat trick of state of the art special effects) combined with smaller, tear at your throat, sentimental scenes about the intrepid hero trying to find out what happened to his wife and son (this part feels a bit more formulaic, but it still gets you). One of the most interesting aspects of the film to me was that even though the place has a warning system that gives everyone ten minutes to get out of town, it has never been used so the populace wastes precious time not really sure whether to take it seriously. These scenes, which come about half way through, of people desperate to escape (at one point, the hero and his little girl drive away only to come upon a long line of cars stopped by a bottleneck, so he gets out of the car with her and just yells at everyone to run…and run they do), are much more horrifying that any scene of mass destruction in a tent pole film from Hollywood. The human factor is never lost here. In some cases, as here, less is far more than more. With Kristoffer Jone, late of the Revenant as the hero Kristian; Fridtjov Saheim of Lillyhammer as Kristian’s boss; and Ane Dahl Torp as Idun, Kristian’s wife.